This pitch backs directly on to the meandering River Lynch. A permanent campfire site provided on this pitch. Nestled in maturing woodland these woodland glades provide camping areas for wild campers who wish to camp without the comforts of a tent. 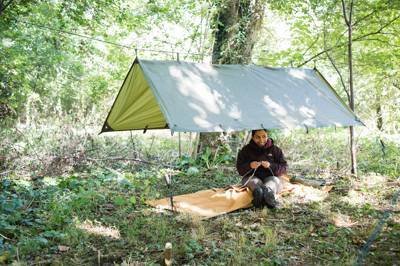 You can either stretch a hammock and tarp between two trees or camp on the woodland floor in a bivi bag. Composting toilets and drinking water supply is only a short walk away. Each pitch has a permanent campfire area so you can make the most of your almost wild camping experience. Wild camping this close to London seems wholly improbable. Impossible even. Yet, less than five miles from the M25, this magical riverside collection of woodland glades and hidden tent pitches is very much the real deal. Campfire smoke wafts its way through a leafy canopy and canoes rest, rolled onto their sides, against tall, native trees. Many campers arrive by bike, pedalling the 16 miles from the towering stadium in Stratford’s Olympic Park, others hop on the train and ride the 30-minutes from London Liverpool Street. However short the journey, though, once here the campsite certainly still feels a million miles away. Created by Lee Valley Regional Park, this ‘almost wild’ campsite has been specifically left untamed and untouched to allow everyone, from escaping urbanites to out-of-towners, the chance to get back to nature. There are only 17 pitches and facilities are little more than a composting toilet, a clean water supply and logs for your campfire. Other than that it’s up to you to use your imagination. Hammocks swing between trees where some hardy campers have decided not to bother bringing a tent and a chatty coupe nudge a canoe into the water, setting off for the short paddle to the local pub. It’s a serene scene. And while some choose to bring the bear ‘expedition’ essentials, the campsite is still an thoroughly approachable place, with families and friendly groups, too, occupying the larger clearings. The real joy of this campsite is the escapism that hiding away in the woods allows. It’s easy to come here for the weekend and never real leave the fireside, save for a brief evening lying silently on the riverbank hoping to catch a glimpse of an otter. If you do venture out, though, the Lee Valley Park has plenty to offer. Covering a vast swathe of countryside either side of the very river that even Adele sings and reminisces about in one of her famous pop songs, the park encompasses a collection of reservoirs and pools set aside for wildlife. On the largest reservoirs there’s still place for people to play, too. Sailing and kayaking are popular and there are several nearby activity centres, while the Lee Valley White Water Centre is renowned as one of the best white water locations in the country. That’s right, despite the flat, edge-of-London location they’ve even managed to craft some of the UK’s best white water. Improbable? Impossible? That seems to be what wild camping in the Lee Valley is all about. Lee Valley Almost Wild Campsite on the borders of Hertfordshire and Essex is your chance for a wilderness adventure with a wild camping, back to nature experience. Embrace Mother Nature in this rugged, natural setting nestled among mature woodland and a grassy glade which is surrounded by water on three sides. With none of the trappings of more commercial campsites you’ll be able camp out under the stars, hang a hammock from the trees and light an open fire in one of the fire pits provided. These facilities complete this unadorned campsite of just 17 pitches and ensure that you get that truly wild camping experience. Please note the minimum age to stay at the campsite is 12 years old. For latest availability and best prices for Lee Valley Almost Wild Campsite, please use the Date Search above. We booked the meadow pitch and got number 7 - it was a huge space for just our one tent but that meant we weren't too close to either of our neighbours, with some bushes seperating each pitch. Really nice and secluded ( well as secluded as you can be just outside London! ), would definitely go again and would recommend! Location, and the peacefulness of the site, while still being able to have music on and have a rake of beers. Each pitch is a generous size, so we didn't hear much from other pitches at all as they are quite spread out. Nice walks along the river, Kayaking very close bye, and some good pubs with just a short walk. The toilets were very clean when we arrived, although started smelling a little by the end of the weekend, as there are only 2 on site. A small shower block would be a great addition, but easy to survive without if only there for a weekend. Also, no swimming permitted on site which we hadn't realised before going. In general though, great site, very clean, easy drive from London and I will certainly be going back. Attended spoon carving workshop on Sunday 29th July. Great venue with fantastic canopy. Didn't even notice it was raining. We really enjoyed the workshop and managed to make a spoon and spatula. Craig was very knowledgeable and would have the confidence now to use an axe, saw and knife safely. Great course if you want to learn a new skill and as an exercise in mindfulness. New toilets are very nice. The ranger kept checking to make sure all was going well too. This is obviously a very well run site and I would recommend it to others especially for courses. Only stayed a night, but will come back to stay again. Definitely need to come with supplies as there is nothing nearby unless drive to nearby town. First time here I was very impressed. The pitches were big and private which made a difference as we love feeing like your there on your own. Defo booking again and again. I want to book a week next time if they allow. Views are lovely and nature surrounding you. We had a wild rabbit that didn’t mind us there. The park ranger was very nice and helpful and the camp site it self has all you need for a great wild experience. We stayed at one of the hammock/bivouac lots at Almost Wild Campsite and it was a fantastic experience! Surrounded by trees and a nice campfire right next to our hammocking spot made the weekend truly enjoyable. You do feel like you’re somewhere off grid yet if you need to get to a grocery store, they’re not too far away. I can only recommend this place to anyone who’s looking for a simple and proper camping experience but cannot travel too far. My cousin and I came to stay for two nights in May 2018. We were blown away by the tidyness and organisation of the site. The toilets are probably the best public toilets that I have ever used, don't think festival, think top hotel! The staff are friendly, knowledgeable and interested in making your stay a success. My cousin is an amputee but found the facilities here easy to use. Access to the site is great for walkers, boaters, cylclists and car users, the site being close to both the trains and the M25... plus the river Lee. We will definitely be using the site as often as we can. Had a really nice night at Almost Wild, very peaceful and calm. The meadow pitches are big and have soft grass but no trees, the woodland pitches and slightly smaller with lots of trees and shade, but the ground is more varied. We booked the riverside pitch because I thought there would be some trees around and when we got there is was crazy hot. The camp ranger guy was very friendly and said we could switch to one of the woodland pitches that had cancelled earlier in the day, made the stay much more comfortable, but strung up out hammock, pitched the tent and made a fire, which was a real plus! Great place for a local nature experience. One downside was the noice, most of the time it was really peaceful and quiet with lovely birdsong, but it seems to be under a flightpath so every half an hour or hour a plane comes over which can be quite loud. I would definitely recommend it to people short on time that want a quick and convenient break from the city, but if you have more time I'd say venture further out of London! Camping and canoeing: the perfect match! My boyfriend and I spent an amazing bank holiday weekend at the Lee Valley Almost Wild campsite. We picked up a canoe from nearby Lee Valley Canoe Cycle and arrived at the campsite by boat, which was fun and easy to do. Gareth, the Warden, is a friendly, relaxed but very professional guy who has a real passion for the site. Not surprising because it is an peaceful, well-maintained campsite, with large pitches, clean (smell-free) toilets, water, fire wood, washing up station, etc.. Gareth was really flexible and let us come on a site a bit early (because we had to pick the boat up at 10.30am). He also saved us when our airbed sprung a leak; he actually gave us a brand new airbed! So, to sum up: lovely host, beautiful site, great facilities, and a location close to lots of fun water activities (plus walking and cycling). We will definitely be coming back soon and recommend you visit too! I grew up in semi-rural Australia, and through a bizarre series of events find myself in a little London flat. I've despaired a lot at a loss of freedom to do things for myself, or to have any space to think and breathe. Well I absolutely could not be more impressed with the entire site. I have stayed twice in a woodland pitch, and I will be back every opportunity that I get. The facilities strike an amazing balance, you have running water, smell-free toilets, a dish washing station, and you are within walking distance of shops if you are low on supplies; but beyond that you can be as rustic as you like. The rangers are all friendly, knowledgeable, and generous with their time. Bushcraft lessons are informative, relaxed, and practical. While I only stayed on a woodland pitch, the fact that both woodland and riverside are so close makes it easy to manage groups: maybe you want to sit in a hammock in a sun dappled glade, and your friend wants to set up their stove with their spacious tent on soft open grass. Easy. I genuinely appreciate everything that Lee Valley Almost Wild is doing, and I will be dragging anyone I can along with me. My husband and I had our first stay here this last weekend, and it definitely won't be the last!! Having grown up camping in the Aussie bush land, we were despairing of finding a similar experience close enough to London to work for weekend trips, until we found Lee Valley. We booked the woodland pitch and it was everything we were hoping for! The pitches feel wonderfully secluded in the trees, and by far a huge perk is being able to have your own open campfire. We were able to cook lovely meals, and felt like we got the rustic camp experience we were looking for, while still having perks of convenience in the form of the washing up station, a cold water tap and very well presented compost toilets that were kept immaculate, with loo paper and hand soap provided, as well as almost no smell due to how they work. A huge befnefit is how easy and accessible the site is from London. As we don't own a car, this was a huge factor in deciding where to go as many places are very tricky to get to, especially as we are carrying all our gear. We took the train from Liverpool Street, and couldn't believe how quick and easy the journey was, the campsite being only a 15min easy walk from the station. As well as that, the local high street being only a 20ish min walk away, so we had lots of options for getting food and water etc. We also took part in one of the bushcraft classes offered, the primitive fire starting one, and found it fantastic. They are well worth doing, being very informative and interesting, with a very hands on approach to having a go with great guidance from our instructor. Overall, it was the perfect trip for us and lives up to the almost wild camping experience it offers. 10/10 and we will definitely be looking to make this our go to for camping weekends. We stayed here for one night on the weekend and had the perfect camping experience - loads of room in our pitch, in built fire pit for our BBQ, amazing toilets and very wild woodland setting (considering its proximity to London). Loved every minute. Will be back! We've been looking for a woodland campsite near London where we can have a proper fire and practice some bushcraft skills. Almost Wild is almost perfect. The woodland sites are well sized and fairly secluded. We used a tent although a hammock setup would be ideal. It rained near constantly but we strung a tarp high up over the fire, so had a good space to hang out. Staff were very knowledgable and friendly. The composting toilets are clean and modern, but the slamming doors need to be fixed. Overall, the whole thing was beautifully simple, well thought-out and peaceful. We'll definitely be back. Wonderful simple site an easy drive from London. Firepits as standard with great wood available to buy. We had pre-ordered it and it was already waiting at our pitch when we got there. We had great privacy on a huge end of row riverside pitch. Excellent compost toilets that were clean and the best i've come across with no nasty smells. Overall lovely set up and surroundings with friendly and enthusiastic people looking after the place. Will definitely be re-visiting! Had a brilliant time at Almost Wild Campsite! Firstly, the staff were welcoming and personable and went the extra mile to make sure we had everything we needed. Secondly, the setting was beautiful, clean, fresh and located next to a gorgeous canal. We had decided to book this specific campsite due to its close location to London. From Liverpool St station it was a mere 45 mins and then a 5 min walk to the site. I could believe it had taken me under an hour to get there! Another thing I'll mention is how lovely the toilets were! Because they are natural compost toilets they didn't smell at all and were kept immaculate. We did a brilliant two hour lesson on how to make fire which was so interesting and fun! When my friends had suggested we did this I secretly reluctantly agreed because I thought it might be a bit boring but I think I enjoyed it more than everyone else!! Highly recommend doing the bush classes. Overall, a 10/10 experience. We are already planning our next trip back! This was less time than my commute to work, cost less that a bottle wine at my local and was one of the best weekends I have ever spent! Our pitch was HUGE, the site itself is surrounded by water, with a peaceful canal on one side, theres also a little canoe dock thats perfect to sip your coffee on in the morning! Each pitch has a fire pit, we went with friends and cooked two meals each day (you can book a grill for your fire and I couldnt recommend doing this enough! made everything so easy!) Theres local shops about a 20 min walk away so you can just stock up each morning for the day ahead. We took a bushcraft skills course on Saturday morning, these are £10 each for the hour and we learned soooo much!! You just head up to the main tent and you can speak to staff about when classes are on. Everyone on site is actually incredibly helpful, theyll leave you to it so you get the wild camping feeling but are also there for any questions you have and really friendly! What I love about this place is you get wild camping buzz with out having to travel far if you live in london. We had looked into a city break for the weekend but booked this on a whim and I am so glad we did!! There is nowhere else I could have gone to that easily where I got to enjoy lush surroundings, learn how to make fire and have so much to do nearby (the surrounding area is so beautiful we had a long walk on Saturday afternoon, theres also Lee Valley activity centre nearby so you can canoe etc). We spent wayyyyy less than a normal weekend in London but had an unforgettable time. It would be great for people travelling through London as well as you can cycle/ drive/take train super easily. I cannot wait to go back! Other bonuses were; the toilets are composting toilet which are also well lit at night and really clean, theres a very eco friendly washing up station, fresh drinking water and you can pre book your firewood so when you arrive its waiting next to your fire pit. This site is small, pretty and the staff are friendly and helpful. We made good use of the firepit at our woodland pitch, and the logs for sale were appreciated. The launch makes river access easy and this stretch of the Lee is lovely. There's a decent riverside pub which does food, the Crown, about 15 - 20 mins walk away, or via the river (one lock in between, slightly tricky to find a good entry / exit point for a paddleboard on the pub side of the lock, but do-able). There's also a boat hire centre opposite the pub. This site was an amazing introduction to wild camping for someone who had never really done it before. To cook and sit by the campfire was a great experience and the site itself was incredibly peaceful despite being not too far from a small town. The staff were really helpful and the limited facilities were perfect, adding to the wild camping feel of my stay. Stayed at the Lee Valley campsite for one night, and can't wait to return! Very friendly, helpful staff. Gorgeous riverside pitches, which feel right in the heart of the countryside, and everything you need from basic facilities - 2 clean compost toilets, a cold water tap and washing up bowls and soap provided in a separate area. Each pitch also as a fire pit, perfect for the summer evenings. Ideal for a 1 night break or longer if you wanted. Fantastic place to get away. Didn't know that such a beautiful and peaceful place could exist so close to normal busy life. It was very relaxing sitting round our own campfire listening to the wildlife. Was really quite and have a great night sleep. Highly recomend and i will be returning very soon. Highly recommend this campsite, especially if coming from London. I cycled out here with camping stuff in my bike saddle bags. Stayed for the one night over the weekend and really enjoyed it. A proper break from the city rush but within very east reach. We will return! 17 pitches in total (12 riverside and 5 woodland glades). Tents, hammocks, groups, dogs (max 2 per pitch) – yes. Campervans, caravans, motorhomes, children under 12 – no. The aim is to offer a wild camping environment, so facilities are basic. There is a composting toilet, cold water tap and a washing up area. The only artificial lighting is solar powered and motion sensored (by the toilet and tap area). Campfires allowed (bag of logs £5). Canoe launch. Fishing from the riverbank. And, if you're really quiet and lucky, you may spot badgers, several different species of bat, kingfishers, muntjac and potentially even the illusive otter. There's plenty to do in the Lee Valley, particularly after the 2012 Olympics injected extra funding to the area as they developed the Lee Valley White Water Centre (0300 003 0616) for the London games. You can get your adrenaline fix today by taking on the Olympic white water course in rafts, kayaks and more. For water sports at a slower pace, though, there is also sailing on the local reservoirs and canoeing on the river, plus canal boat tours nearby. There's a boat launch area at the campsite, too, if you have your own canoe. The entire canal has an adjacent tow path, which leads all the way to the Thames and runs directly past the famous 2012 stadium and Queen Elizabeth Olympic Park (0800 072 2110), as well as linking up with Regent's Canal and Victoria Park. Closer to home, though, the whole network of pathways weaves throughout the Lee Valley Park (0300 003 0610) with ample wildlife to discover. In short, be sure to bring a bike or boat if you have one! There are three pubs within easy walking distance – The Crown (01992 462244) on the riverside, the characterful, wood-panelled Bull (01992 462639) in town and The White Bear (01992 441389) also in town. The main parade of shops in Broxbourne also has a number of takeaways, as well as local shops and a small supermarket – all within walking distance. There's a large main supermarket on the far side of town, too, if you're willing to hop in the car. Infrequent dates (mainly weekends) from late March – end of September. Check calendar for exact details. From the A10 take the Broxbourne exit. At the roundabout take the first exit sign posted Broxbourne. Follow this road over all the mini roundabouts until you reach the T junction traffic lights in Broxbourne. At these lights turn right (following signs to the train station). Follow this road, passing the train station on the left, over the bridge and passing Broxbourne Riverside on your right. Just past the entrance to Broxbourne Riverside you’ll find the entrance to the campsite in the wooded treeline on the left. When arriving at the site with your car please park in the car park that is a short walk away from the main camping area. It's an easy 15-minute walk to Broxbourne railway station (0845 748 4950), with frequent and regular services running on the main London Liverpool Street Line. From the station, walk towards the main road, turn left and follow the pavement until you see the sign for the campsite – on the left hand side in the wooded treeline. Buses also run along Nazeing New Road. There are bus stops at the junction with Old Nazeing Road which is closest to the site.